There is something magical about the experience when it comes to the early morning alarm calls of Spotted Deer and Langur monkeys in the sub-continental forests and the languid appearance of one of the planet’s most powerful and breath-taking predators, so sadly struggling to maintain its place. With an itinerary that offers over a week’s photography allowing for travel time before and after, our chances of enjoying those elusive but awesome encounters is maximised, alongside our top local guides and our own photographic experiences of working at this particular reserve. 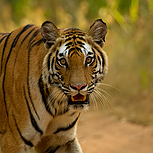 It’s always a challenge to photograph tigers at this time of year but the green lush vegetation so soon after the monsoon season and before the dry heat to come, but the rewards when we do are photographically worth it, and that’s what this trip is all about. Add in the fact that this is just one of those species that will be high on any nature photographer’s wish-list and we know it’ll be full of experiences that will stay with you as long as the images. Day 1: Leave UK on an overnight flight to Delhi. Day 2: We are due to arrive in Delhi via our connecting flights by mid-morning. We will go to a currency exchange to get our Rupees and then arrange a taxi at the airport and transfer to our Delhi Hotel for a day of leisure and an evening’s rest. Over dinner we will discuss the plans of the forthcoming trip. Day 3: In the early morning we will connect with our internal flight to Jabalpur. From Jabalpur airport we are met by our transfer driver and it is then a 4 hour drive to our destination which will take us to Bandhavgarh National Park. From then on we will be based in a comfortable and remarkably tranquil lodge in the small village of Tala near Bandhavgarh National Park owned and run by our resident expert guide Satyendra Tiwari and his family whose knowledge and tracking skills we will have to aid us throughout the trip. All meals are freshly prepared at our lodge and please note that it is strictly a vegetarian diet throughout. Once we have arrived at our destination we will only have short time to get ready for our first game drive that afternoon. Day 4: It is an early morning start for our first encounter with the tigers and we need to be at the park entrance by 6.00 am. We will have three vehicles for our group and there will only be three people per jeep so we will have lots of space. There will be plenty of opportunities to photograph lots of different wildlife species like spotted deer, majestic samba, and wild boar and of course the ever playful langur monkey but our main priority throughout this trip is to photograph the beautiful Bengal tiger. Throughout our trip we will make morning and afternoon game drives, the morning’s drives will last from 6.00 am to 11.00 am and we will then go back to the accommodation to have a late breakfast and rest and we will also use this time to download our images from the morning session. We rest during the middle part of the day as it is too hot then and the light is too harsh for photography. After a light lunch we are back out in the afternoon for our afternoon game drive which will be from 2.30 pm until dusk. We then go back to our accommodation for the evening. 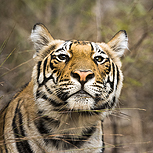 Days 5-10: These days are a repeat of Day 3 as we follow the same pattern throughout our stay; our ultimate aim will be the Bengal tiger as Bandhavgarh has got a healthy viable population of this beautiful mammal. The Bengal tiger can turn up literally anywhere whilst we are in the park, we might encounter one walking down the track but usually the best chance of seeing and photographing the tiger is when one is spotted by our guides or the park rangers, we will have a park ranger with us at all times and these guides are very knowledgeable for looking for signs and tracks but also listening for the tell-tale signs of the jungle which the alarm calls of the monkeys and more importantly the spotted deer give the game away of this illusive cat. Day 11: After a final morning drive we will begin the journey home, returning to Delhi via Jabalpur (where we will catch our return flight to Delhi) and where we will stay overnight. Day 12: We will leave Delhi for our return flights which will arrive back later the same day. Transfers from the airport, accommodation, local transportation, all meals. All flights, sundry items, tips and alcohol. Our first and last night will be in a hotel near to Delhi airport and from then we will be based in a clean, comfortable and remarkably tranquil lodge. All meals are vegetarian and freshly prepared at our lodge. In a physical sense this is not an especially hard trip but traveling in India is unlike anywhere else, and given this alongside early morning drives (offset by rest periods during the day) this can be a tiring trip.